Cricket is a team game. Each and every individual has a role to play if a team is to win. 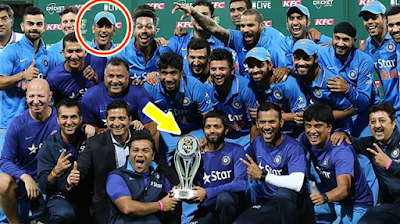 Generally, the captain collects the trophy, and Dhoni has done it many times. After collecting the trophy, Dhoni always handed over the trophy to youngsters. It is a great gesture because youngsters could enjoy the moment more. In 2013, India toured West Indies for a tri-series, and Sri Lanka was the third team. Dhoni was injured and Kohli led the side during the league stage. He came back to the team in the final and finished the game in a last-over thriller. When Dhoni received the trophy, he shared it with Kohli as the latter led the team well in the group stages.